Dr. Mary Erickson, who joined the faculty at Santa Barbara State College in 1939 and was instrumental in transforming the school into a University of California campus, founded the vertebrate collections in 1962 to provide support for the zoology courses she and other faculty taught. Dr. Erickson's close colleague and contemporary, Dr. Barbara DeWolfe, contributed large numbers of specimens to the avian collection in its early years and has continued to be a benefactor of the collections to the present day. Upon joining the UCSB faculty in 1972, Dr. Stephen Rothstein gave high priority to the maintenance and enhancement of the vertebrate and especially the avian collections. Mark Holmgren became Collection Manager in 1984 and he and Dr. Rothstein contributed many more specimens to the avian collections in the last three decades. The collection contains about 9,400 specimens. There is a good representation of species found in southern California, including the near ocean and the Channel Islands, and also many species found elsewhere in North America, Mexico, and Europe. Special efforts have been made to collect species of particular biogeographic interest in southern California, such as those that have subspecies boundaries within the region. In addition, the collection has especially large series of several species that have figured prominently in the literature on ornithology, evolution, behavior and physiology, such as the White-crowned Sparrow, Brown-headed Cowbird, Grebes, Acorn Woodpecker, Wrentit, Savannah Sparrow, and Spotted Towhee. 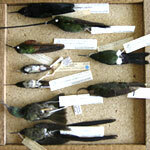 In addition, the collection houses specimens that have contributed to numerous studies published by UCSB researchers. 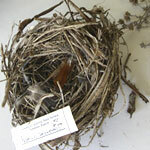 The ornithology collection can be searched for through our Specify Web Portal.